Line a large rimmed baking sheet with unbleached parchment paper and set it aside. In a large, heavy-bottom pot, place the oil or brown butter, brown sugar, honey, maple syrup and salt, and whisk to combine well. Cook over medium-low heat, whisking frequently, until the sugar is melted (about 2 minutes). Remove the pot from the heat, and add the almonds, pumpkin seeds, coconut chips and oats, and mix to combine and to coat the oats, nuts and seeds in the oil and sugar mixture. Spread into an even layer in the pot, and return the pot to the heat. Cook for about 5 minutes over medium to medium-low heat, and then stir to turn over the mixture. Cover and cook again for about 5 minutes, then stir. Repeat once more, or until the mixture is deep golden brown. Remove from the heat, pour in the dried fruit, and mix to combine. Scrape the granola onto the prepared baking sheet, and spread into an even layer. 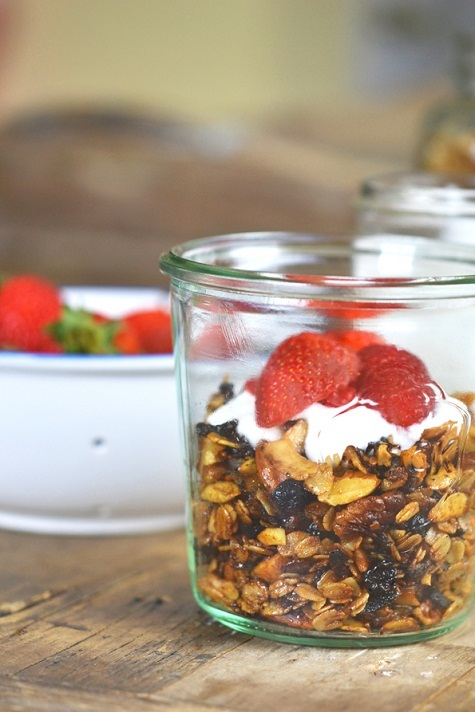 Allow to sit at at room temperature until completely cool before carefully breaking up the granola into large chunks. Store any leftovers in an airtight glass container with a lid.